In a move that came out of nowhere, in a bid to celebrate the one year anniversary of release Xenoblade Chronicles 2’s release on the Nintendo Switch (December 1, 2017,) Monolith Soft have issued a new update for both Xenoblade Chronicles 2 and Xenoblade Chronicles 2: Torna – The Golden Country. Although both updates are small in size (version 2.0.2 for the main game and 1.0.2 for Torna,) with them comes something of a huge surprise. As leaks, datamining and official footage have revealed (SPOILER WARNING,) like Pyra, Tora and Zeke, Mythra from Xenoblade Chronicles 2, also appears in Super Smash Bros. Ultimate as a Spirit, only her appearance is censored. Whereas before cleavage could be seen and her legs, in Smash, Mythra can be seen wearing black trousers and her cleavage is covered, in a bid to censor her and this censorship is now available in both Xenoblade Chronicles 2 and the Torna expansion. Step 3: Make sure you have proceeded far enough in the game that you have progressed onwards from Chapter 4. Step 4: Skip Travel to the Salvage Deck in Argentum. Step 5: Near the “Salvage Deck” Salvage Point, you should see a Nopon called Brobro, talk to him. Step 6: When BroBro is finished talking, (a few Aux Core and Smash related lines,) you will receive the Massive Melee Mythra Aux core. Equip it on Mythra to have her wear it. Bonus Step: After receiving the Massive Melee Mythra Aux Core, talk to BroBro again for more Smash related lines. A copy of Xenoblade Chronicles 2 and the Expansion Pass for Torna – The Golden Country, or just own Xenoblade Chronicles 2: Torna – The Golden Country separately. If you have Torna as part of the Expansion Pass for Xenoblade Chronicles 2, the update will happen when your update the main game. Step 3: Make sure you have proceeded far enough in the game that you have already encountered Addam and Mythra and fought them. Step 5: By the campsite, you will see a Nopon called “Nameless Wanderpon,” talk to him. Step 6: When Nameless Wanderpon is finished talking, (mostly lines about him being a traveller and finding an Aux Core,) you will receive the Massive Melee Mythra Aux core. 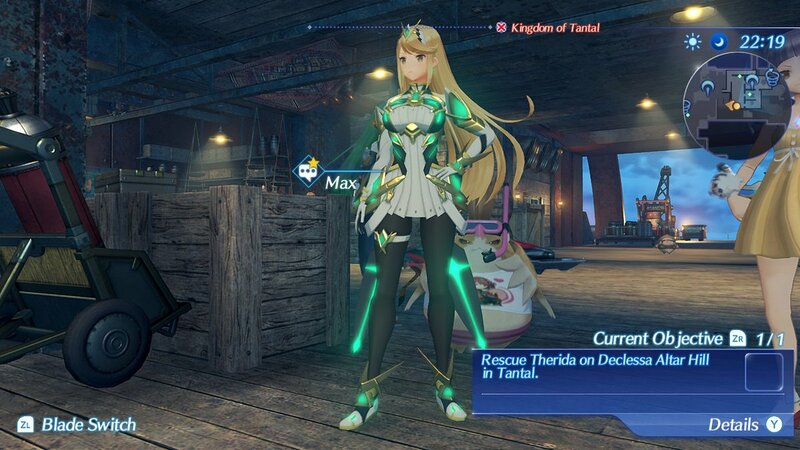 Equip it on Mythra to have her wear it. Bonus Step: After receiving the Massive Melee Mythra Aux Core, talk to Nameless Wanderpon again for more Smash related lines. And that as they say, “is that.” Getting the Smash censored attire really is that simple and as always, we hope you find this guide helpful.